A solution to better understand your customers and optimize their shopping experience. Client, consumer has evolved a lot in recent years and so has his journey. As the number of touch points increases, however, about 50% of consumers will continue to buy in-store by 2030, according to a Comarch survey conducted in 2017. It has become essential for the physical store to provide an enriched experience. Our approach to shopper tests in real shopping experience helps you to establish a big picture of your store and to detect optimizations: seeking out shopper and brand insights. 1. 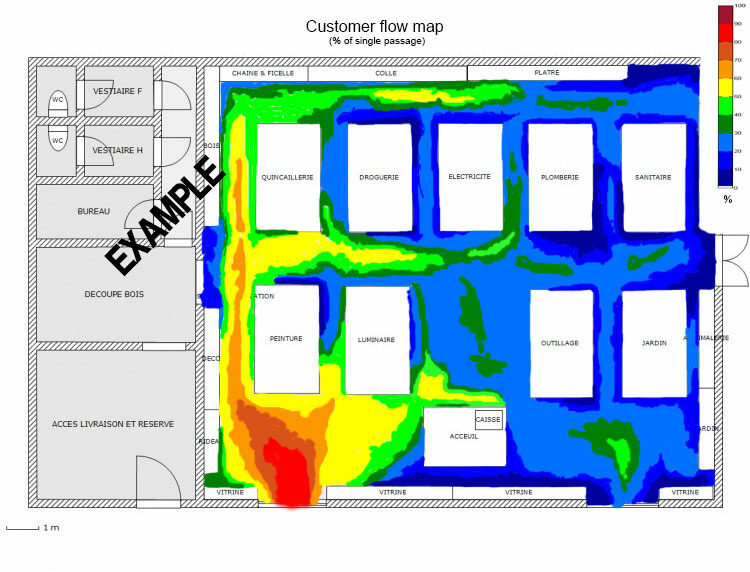 WHAT ARE THE HOT AND COLD AREAS OF YOUR STORE? We provide you a heat map to view these areas, with other more precise information (time spent in the store overall and in specific areas, attractiveness of the shelves, handling of products, contact with sales assistant, and so much more). To do this, we integrate your store plan into our shopper app. 2. WHAT ARE YOUR CUSTOMERS LOOKING AT IN YOUR STORE? 3. WHAT IS YOUR CUSTOMERS’ PERCEPTION OF YOUR STORE? In addition to the observations data, the analysis is supplemented by in-depth interviews with customers to obtain their opinions on the store overall, as well as on various departments or even on the shop window.